It is difficult enough when a loved one dies and even more difficult and challenging if you are the administrator of the estate or trust. Knowing the steps to follow and building your checklists and road map will help make this very difficult time less trying. 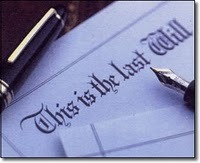 As an estate and trust lawyer, I am asked frequently, "what do I do if my spouse dies", or "what are my first steps". This article will help start to answer those questions. Here we explore your initial administration tasks and checklist. Use this in your meetings with the estate or trust lawyer to help guide your meetings and in developing your master action list of all tasks you are responsible for. Your master action list is your list of ALL actions and tasks that you take or assign to others from the beginning to the end of the estate or trust administration. This is not meant to be used as your master action list, but as a guide to follow to understand the initial steps in estate or trust administration and to help you build your master action list. Here is an excellent article from the Colorado Bar Association that you will also find useful. File the decedent's Will with the Court or determine the requirements to register the decedent's trust. You will also determine the necessity of obtaining taxpayer identification numbers for the estate or trust. Take steps to reduce identity theft by contacting Social Security, the DMV, all banks and brokerage firms where the decedent held accounts. The Death Certificate will be necessary at some places. Close the decedent's accounts, but not trust accounts if there are any. Determine the property and assets. You will do this with the estate or trust attorney. You will be creating schedules of assets based on how assets are owned by the decedent. I have discussed in prior articles the ways that assets can be owned. Obtain asset values. All of the assets must be valued as of the date of death. These are easy to obtain, and the estate or trust attorney can help you. Determine if a probate proceeding is necessary. This will depend on your state law, the type of assets and ownership or title by the decedent. Determine whether estate, inheritance or death tax filings are required for either the IRS or individual states. Again, the estate and trust attorney will guide you. Start your accounting as of the date of death. You are required to track all receipts and all disbursements from the date of death forward. With the guidance of the attorney determine who will receive copies of the decedent's Will and/or trust. Commence the estate or trust administration. These ten steps will get you started, provide direction and help you in developing your master action list. Administering an estate or trust is like playing croquet, you learn the map, then proceed through the right hoops in the right order until you get to the finish. I'd like to hear your comments. Did you find this helpful? Do you have further questions? Please join our conversation and let me know. Thank you. My estate isn't big enough. The estate tax exemption now protects me. There are other reasons, but these seem prevalent. As you can imagine, reasons such as these have no validity, but do prevent people from protecting their families. In my town of Castle Rock, CO, I am the only full-time estate planning attorney. Helping folks work through these issues is very important and I would like to hear what you think. What are your thoughts about these issues? Do you think these reasons are valid? What did you focus on when you decided to proceed with your estate plan? How do you suggest to people the importance and need for estate planning? Studies show that people will spend more time and money every year on a vacation then they will ever spend on their own estate planning. Given how important it is to protect family. I look forward to your thoughts and comments. Thank you.